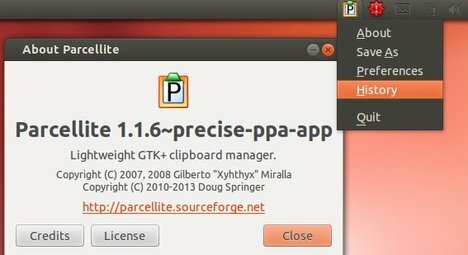 Parcellite is a lightweight GTK+ clipboard manager for Ubuntu Linux. The latest version has reached 1.1.6 with updates and bug fixes. Here’s how to install it in Ubuntu 13.10 Saucy, Ubuntu 13.04 Raring, Ubuntu 12.04 Precise, Ubuntu 12.10 Quantal and Linux Mint as well as the indicator on Unity Desktop. Fixed Bug #99, Broken CLI functionality. Now looks at XDG_SESSION_COOKIE, XDG_SEAT, and DISPLAY, introduced by multi-user fix. Fixed bug where if fifo are not found in client mode, parcellite segfaults. Apply patch for typo in German translation, patch #30. Added script to generate parcellite.pot & check in file, and gets run before each release from rel.sh.